For any paving, landscaping, maintenance or other custom projects, we're the team to call for outstanding service and professional results. Learn more about our most recent Los Angeles home improvement projects by scrolling down below. Customer Issue: The customer wanted his old concrete pavement re-made with pavers. Our Solution: After deciding on the type and style of pavers (there are so many to choose from! ), our first project was to break and remove the old concrete and level the ground. We then moved to installing the pavers, of course making sure Mr. Combs was informed about the process in every step of the way, and of course satisfied with the final results. 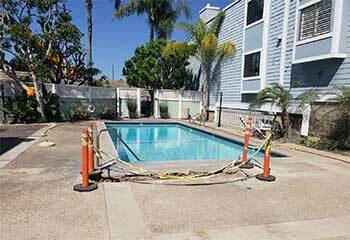 Customer Issue: A modern deck installation for a new pool. Our Solution: After measuring and going over the possible design options, the customer decided to go for a modern wooden deck to go with his wooden patio theme. We installed the new deck and made sure Mr. Mull was 100% satisfied with the results! 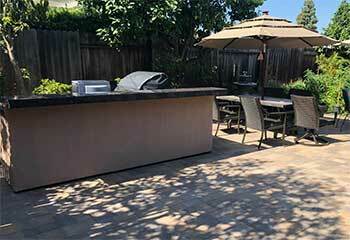 Customer Issue: Needed planning ideas and installation of a new fire pit in the backyard. Our Solution: For many home owners who love to host, backyard fire pits are all the rage! Our team came out first to measure the parameter and examine the style the customer was interested in. 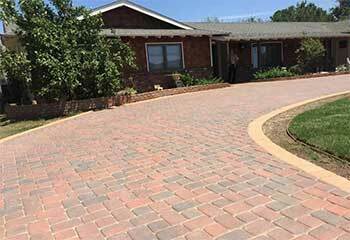 After deciding on a classic circle bricks and pavers design, we completed the installation within the week.